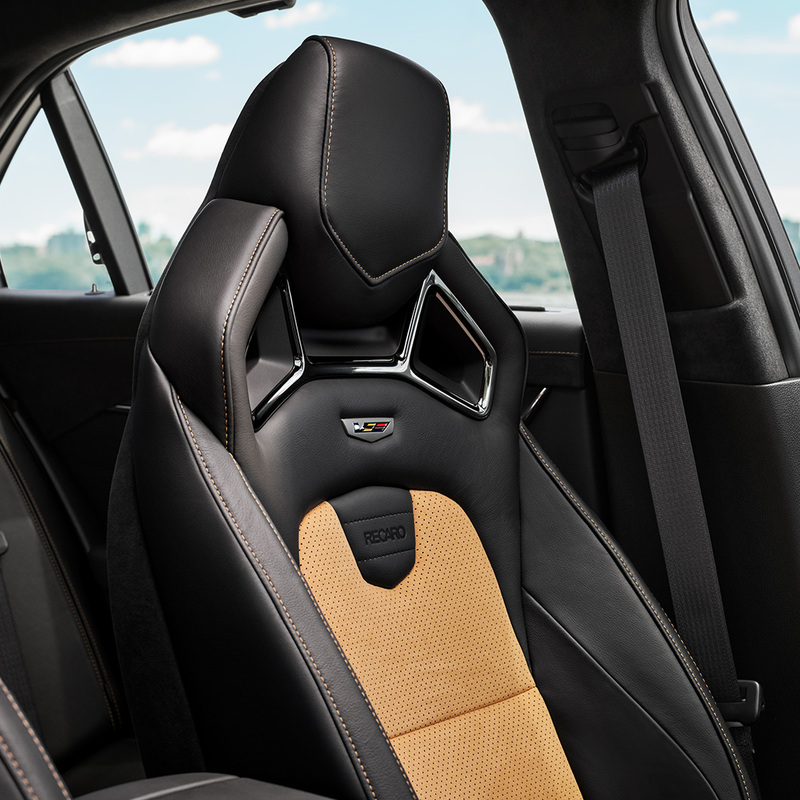 The Cadillac CTS-V’s dual-purpose capability carries over to the interior, where the design and relationship of key components are focused expressly on performance-driving ergonomics. Handcrafted cut-and-sew elements, with decorative stitching and authentic materials, surround performance seating, features and technology. Available 16-way-adjustable RECARO performance front seats are the lynchpins for the driving experience, with aggressive, adjustable bolsters that help hold the driver and front passenger in place during high-load cornering. They also have a luxury-performance feel, trimmed in Mulan leather with sueded microfiber inserts and seatbacks. Twenty-way-adjustable, semi-aniline leather-trimmed seats with sueded microfiber inserts are standard. An available sueded microfiber steering wheel and shift knob complement the seating. The Cadillac CTS-V features a high-definition, 12.3-inch instrument panel cluster display, with V-Series graphics and distinctive gauge readouts and complementing full-color head-up display. The available Performance Data Recorder (PDR) enables drivers to record, view and analyze driving experiences by capturing real-time video, cabin audio and performance data. The system – which features an HD camera and performance data acquisition hardware – is controlled via Cadillac CUE’s color touch screen. Recordings can be reviewed on the screen when the vehicle is parked or saved to an SD card to view or share from another device. PDR data can be analyzed using Cosworth Toolbox, a free suite of analysis software developed from racing analysis software and designed for use with the PDR in the Cadillac ATS-V Sedan and Coupe and the Cadillac CTS-V super sedan. V-Series owners can use Cosworth Toolbox to review laps to quickly improve performance such as braking points, accelerating points, driving lines and corner speeds. The Cadillac CTS-V offers front and rear park assist, as well as Automatic Park Assist – which enables the car to steer itself in parallel and perpendicular spaces – and the Curbview Camera. It provides a view of the lower-front of the CTS-V to help protect the front splitter when parking. Three interior color combinations are offered: Jet Black, Jet Black with Light Platinum accents and Saffron with Jet Black accents all with a sueded microfiber headliner.